Manyara Regional Police Commander Agostino Senga. Babati — An attempt to prevent poaching in the Tarangire National Park ended disastrously for a village chairman here as alleged poachers killed him by cutting off his head. 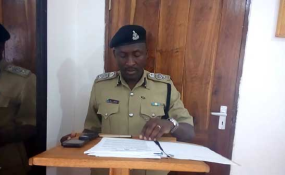 Police in Manyara is holding a resident of Gijedabung' village, Babati district, Manyara, Limito Lebangu (19) for questioning in connection with the brutal killing of the village chairman, Mr Faustine Sanka (59). Sanka's dead body was found, with the head separated from the whole body, on February 14, at Gurusi area within the Tarangire National Park, according to the Manyara Regional Police Commander, Agostino Senga. Police launched investigations into the matter as soon as it was reported and gathered information to the effect that Lebangu was one of those involved in the killings. "Preliminary investigations reveal that Sanka was advancing the fight against poaching in the Tarangire National Park. In the process of preventing poaching, Sanka reported Lebangu and some of his colleagues to game rangers at the Tarangire National Park and that was why they decided to kill him," said Mr Senga. Detailing, Mr Senga said before being killed, Mr Sanka left his house - on a motorbike with registration numbers T 942 BKE - at around 6:00pm on February 9, 2019. "They killed him by cutting off his head using a sharp object. After killing him, his body was wrapped in a plastic bag and his motorbike was left there," said Mr Senga. He said Lebangu admitted to have taken part in the killings and that he cooperated with his colleagues identified by the names of: Hamis Hussein, Miradi Hikidimu and one who was identified by one name as Azizi. He said the investigations into the case were incomplete as police continue with the hunt for the remaining suspects.